Pilgrim gets the inner wheels airborne—something he's wary of doing when the speeds increase. Once a racing driver gets acquainted with the response and incredible poke of thoroughbred racing cars, they often seem to grow tired of the road-going toys. 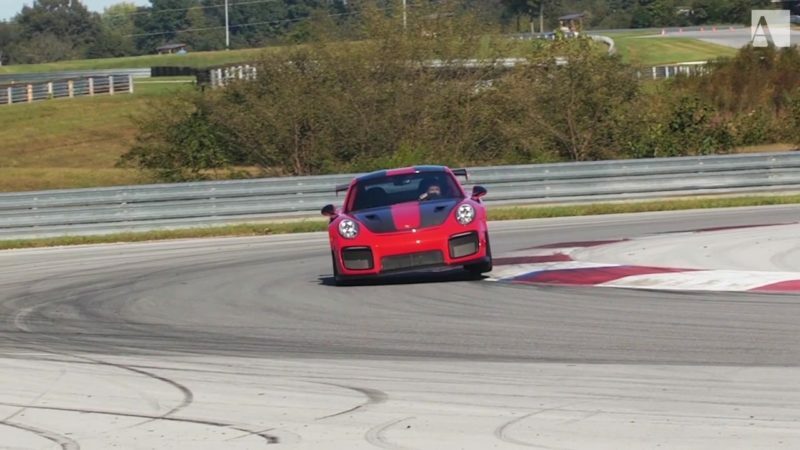 That's why getting a seasoned veteran to praise the GT2 RS is a large part of why this car is so endlessly fascinating to the avid track rat. Few road cars have the purpose and focus that can genuinely wow a professional on the circuit, so when Andy Pilgrim, SPEED World Challenge GT Champion, waxes lyrical about how stellar this car is and proceeds to set a new production car record at NCM Motorsports Park, you can't help but feel some reverence for this beast. It's not only the squat stance, neck-stiffening grip, and straightline speed that appeal to Pilgrim. The fit and finish is top-notch, and with the number of options available to one looking to customize, the GT2 RS is also a tinkerer's toy which can be admired standing still. This is no spartan, scruffy track car—it's a jewel that actually corners. It's good to have this car in the hands of a few pros to see the full breadth of its abilities. Mike Skeen showed us recently how capable the car is at administering its grunt on a slow-speed track, and Pilgrim shows us its high-speed manners. His smooth driving almost masks the outrageous speeds he's carrying, though we get to see the stability the aero kit offers as he passes the triple-digit mark. Note Pilgrim's careful usage of curbs; how he nudges some when the car is unloaded but avoiding them at higher speeds—something Chris Harris forgot to do when testing a fettled version of the GT2 RS and suffered a pant-wetting moment as a result. In fact, Pilgrim notes how using a lot of curb "makes the car quite unstable" and we can see how the bouncing at 5:10 could upset the car if the speeds were greater. As the speeds increase, the car seems to work better, and a mild wobble at 135 miles an hour (5:23) is easily held. With the feedback, aero grip, and relatively mild breakaway, this monster is still controllable and encouraging—which is not something many 700-horsepower cars can boast about.